The first time I had infused water was at a spa, so every time I have one I seem to have a more relaxed feeling. We all know about the benefits of drinking more water but water can get boring. 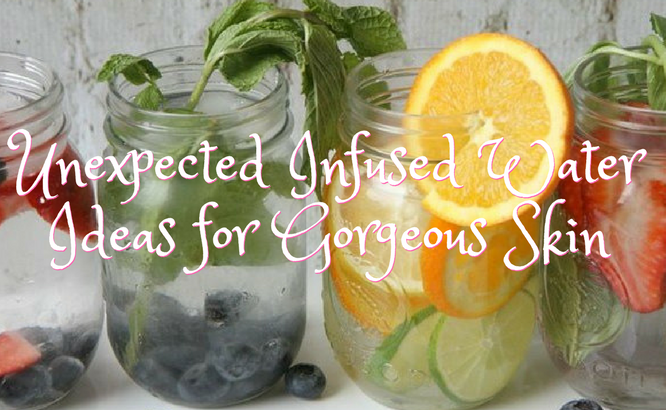 Here are six fresh infused water recipes that’ll pack a punch of flavor and add health and beauty benefits to your H2O! If you’re new to infused water it’s pretty easy - chop up the ingredients, let them sit overnight in a water pitcher and sip your way to healthy hydration inside and out. This combo might seem weird, but adding the health benefits of ginger and the antioxidant power of mangoes is a tasty mix! Mangoes contain many vitamins that help boost your immune system. It has antioxidants that maintain glowing skin and aids in the production of blood cells. Ginger is helpful in fighting infection, has been linked to lower cholesterol levels, may reduce muscle aches, and helps digestion. Recently rosemary was found to be the main ingredient eaten by residents of an Italian village with one of the highest populations of people who live past 100! Rosemary improves circulation and sends more blood to the brain which is linked to greater concentration and potentially reduces risk of Alzheimer’s. Grapefruit is a natural fat burner, boosts metabolism and cleanses your liver. Cut up watermelon, honeydew and cantaloupe chunks and throw into your water over night. This melon assortment tastes great and is amazing for your skin. Melons are extremely hydrating – even more hydrating than a cup of water. They are also full of antioxidants that keep skin clear and they contain vitamins that promote collagen production which helps skin cell turnover. Cut your favorite citrus fruits into slices and add some crushed mint to your water. Adding mint to water is super refreshing but it also improves digestive health and can speed up your metabolism. Mint actually contains salicylic acid, an effective acne fighter. It also has anti-inflammatory properties which work to calm irritation both inside and out. The reason so many spas use cucumber based treatments is because it contains skin friendly minerals like magnesium, potassium and silicon. Cucumbers are powerful detoxifiers, flushing out any waste in your system. Adding crushed lavender to the mix not only adds a beautiful aroma but can also help digestion, lavender contains polyphenols that reduce bad bacteria in your gut, making your system run smoother. This one is almost cheating… almost. Get your favorite store bought raw coconut water and refrigerate overnight with large chunks of pineapple. The coconut-pineapple flavor combo is delicious and reminiscent of a piña colada without the sugar and calories. Although this is not pure H2O (it’s easier than cracking open a coconut ;p), coconut water contains electrolytes, which will rehydrate you in no time. Pineapple is another fruit that helps with collagen production – skin, bone health and tissue repair. Water does not have to be boring, it can be delicious. Drink up!